Tuvalu is the first nation in the world threatened to be submerged due to the adverse effects of climate change. 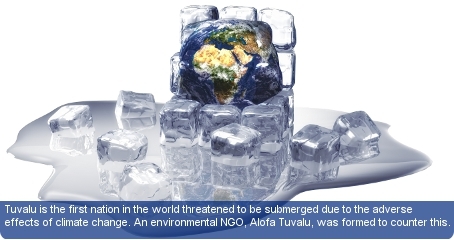 An environmental NGO, Alofa Tuvalu, was formed in 2005 to devise coping and mitigating mechanisms to this threat. The NGO has several hundreds of members and receives support from the governmental agencies and corporate bodies. Other prominent civil society organisations include the Tuvalu’s Association of NGOs (TANGO), the Tuvalu National Council of Women and the Tuvalu National Youth Council. TANGO, the official umbrella organisation for NGOs in the country, is encouraging and assisting NGOs in their developmental work mainly through capacity building and networking. The Tuvalu National Council of Women is working to empower women. The Tuvalu National Youth Council is encouraging developmental youth projects and is advocating Government and donors to provide resources for youth development projects. Tuvalu only has one registered trade union: the Tuvalu Overseas Seamen’s Union (TOSU) which represents workers on foreign ships. The Tuvalu National Chamber of Commerce (TNCC) was established with the intention of promoting a business environment. The majority of businesses in Tuvalu operate in the private sector which has caused private sector members withdrawing from TNCC and creating the Private Sector Organisation of Tuvalu (PSOT).